The Duruthu Perahera celebrates Lord Buddha’s first visit to Sri Lanka more than 2500 years ago. Attracting hundreds of thousands of people to the sacred Kelaniya Temple in Colombo, the perahera (pageant) features dancers, musicians, devotees and elephants. The festival reaches its climax with the Randoli Perahera, the most magnificent of the processions, held on the day prior to the January full moon. Galle Literary Festival affords visitors an opportunity to appreciate the work of Sri Lankan and international authors, engage in literary discussions and other intellectual and artistic activities. 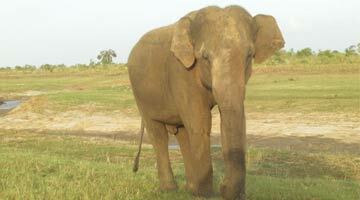 It’s set in and around the UNESCO World Heritage city of Galle. Independence Day features one of Sri Lanka’s grandest outdoor parades, commemorating the country’s gaining of independence on the 4th of February 1948. Pomp and pageantry are the order of the day as well as displays of traditional Sri Lankan art forms. The streets of Colombo are transformed with around 100 colorful elephants during February’s full moon day. Held since 1979, the Navam Maha Perahera has annually attracted more than a million spectators to the Gangaramaya Temple, at Hunupitiya by picturesque Beira Lake. The event usually has as many as 1000 performers. The kasa karayas inaugurate and lead the processions by cracking their whips in the air. Plenty of noise is contributed by conch shell blowers, stilt-walkers, and drummers, but the real guests of honor are the majestic elephants, that come from all over the island for the pageant. Observed by all Christians commemorating the crucifixion of Jesus Christ and his death at Calvary, ”Easter” is a celebration of the resurrection of Jesus Christ. Easter Sunday is held two days after the Good Friday and three days after the Maundy Thursday. Easter also marks the end of Lent, a season of fasting, prayer, and penance. Easter is a moveable feast, meaning it is not fixed in relation to a particular date. The Sinhalese and Tamil communities in Sri Lanka celebrate the Aluth Avurudda – their mutual New Year. The festival coincides with the end of harvest, so the bounty from colorful fruit trees fuels celebrations. Festivities are prepared well in advance and most of the country grinds to a halt as people travel home to be with their families. A variety of domestic rituals take place, determined by astrological calculations, like lighting the fire and making kiribath (milk rice). Once all customs are done, the celebrations begin as families gather in the streets and homes are thrown open. 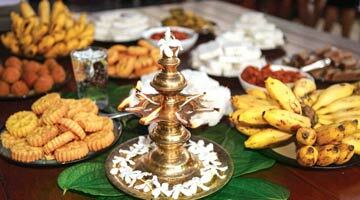 The ubiquitous plantain is dished out alongside celebratory feasts of Kawum (small oil cakes), Kokis and Athiraha. The Bak full moon Poya day - one of the 12 Poyas in the Buddhist calendar commemorates the second visit of the Buddha to Sri Lanka, which took place in the fifth year of his Supreme Enlightenment. On this day, Sri Lankan Buddhists cease worldly pursuits and engage in religious activities. Vesak is the main Buddhist religious festival in Sri Lanka with people celebrating the triple anniversary of the Lord Buddha – his birth, his attaining of Enlightenment and his passing away into Nirvana. Colorful bamboo-framed lanterns adorn the interior of homes and luminous displays decorate the streets of towns. Visit Fort, Bauddaloka Mawatha, around the Gangaramaya Temple, to catch this glowing spectacle in full glory. Vesak also marks the first month of the Buddhist Calendar. This is a day spent in reflective prayer as people cease worldly pursuits and engage themselves in religious activities. Devoted Buddhists pray in temples from dawn until dusk. As the sun sets, devotees partake in processions and return to the temples in the evening to hear monks read stories from sacred texts. Roadside stalls distribute free refreshments to passers-by. There are mime and street theatre performances, staged on tall platforms near temples in cities and towns throughout the country. Walk the World is a global event hosted to raise awareness about child hunger. Dancers add color to the 5km walk and are joined by locals, visitors and children from around the country. Activities in Sri Lanka are led by the World Food Programme country office in partnership with the Sri Lanka United Nations Friendship Organization (SUNFO). The Sri Lankan Airlines Pro leg of the ASP World Qualifying Series makes the most of the superb surf at Arugam Bay on the south east coast of Sri Lanka. Competitive surfing is organized by the Association of Surfing Professionals (ASP) along a two-tier system. The highest level is the World Championship Tour (WCT), where the top men and women compete for the crown of World Champion throughout the year. The second tier is the World Qualifying Series (WQS), which has about 40 competitions per year. The top WQS surfers strive to make enough championship points to break into the following year’s championship tour, but the events are also a great opportunity for local surfers to showcase their skills. 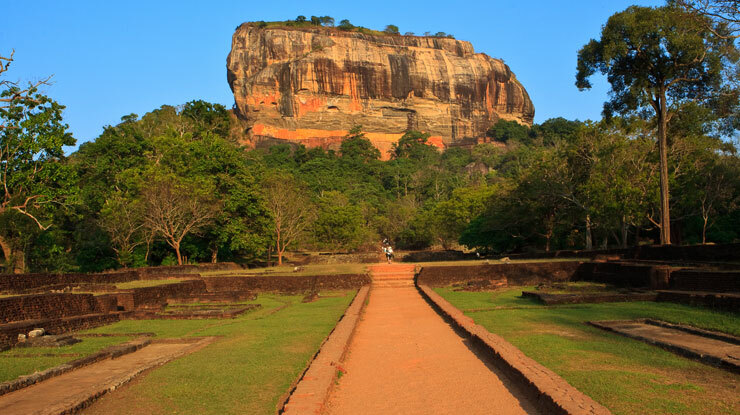 It was here in this ancient city that Sri Lanka’s king was converted to Buddhism by Arahat Maha Mahinda, the son of King Asoka (Emperor of India). As the king was hunting deer, Mahinda appeared to him in a grove and asked him a riddle about a mango tree (Ambasthale means mango tree). After the king had answered the riddle, he apparently agreed to follow the teachings of the Buddha and declared it as the state religion. The Ambasthale Dagoba is a temple which towers above the city of Mihintale, accessible by 1840 steps and built over the very spot where the venerable Mahinda thero is said to have appeared before the king. This is one of the most famous and popular festivals in which hundreds of devotees come to witness the event with intense religious fervor. The chariot procession with the participation of hundreds of Hindu devotees, chariot dancers begins from the temple during Mayurapathy Chariot Festival and is carried throughout the day. One will also be mesmerized by the awe-inspiring sights in which men in a state of devotional trance dangle from the hooks. Another very important Hindu event takes place in the town of Kataragama; with two weeks of celebration the festival culminates in spectacular performance of devotees walking over burning coals. Devotees, dressed in their dhotis and ceremonial markings, turn up with huge earthenware vessels on their heads. The festival highlight is the grand procession at night with the participation of colorfully dressed dancers, elephant and hundreds of devotees. In the Buddhist month of Esala, one of the most important annual Buddhist celebrations takes place Kandy. One of Buddhism’s most sacred relics, the Sacred Tooth, is taken from the Dalada Maligawa Temple (Temple of the Tooth Relic) in a golden casket and paraded through the streets of Kandy in a procession of richly decorated elephants, fire-juggling acrobats, dancers, musicians, whip crackers, torch bearers and thousands of barefoot pilgrims. The procession takes place every night with parades getting longer until the final night when the pageant is at its best. A fun filled event for children and adults alike. Large crowds gather on the beach to see the colorful kites made of saris, paper and other material. Celebrating the nine-day Navarathri festival, to commemorate the nine days and nights that Goddess Durga fought the Asura, she is worshipped in all her innumerable forms, signifying the triumph of good, piety and devotion over evil. Also referred to as Dasara, prayers are held for the first three nights for Goddess Thurgai (bravery), the second three nights for Goddess Lakshmi (wealth) and the final three nights for Goddess Saraswathy (education). Sri Lankan Airlines Golf Classic event is one of the most well known golf events of the country. Victoria Golf Club, the venue of Sri Lankan Airlines’ golf classic event is situated just outside Kandy. 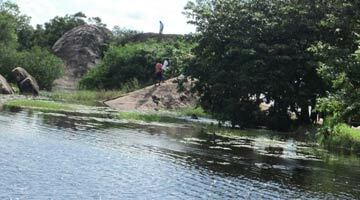 Here the experience of teeing off is simply out of the world in exotic surroundings which is the reason for its charm. It has been rated amongst the hundred most beautiful golf courses in the world. Deepavali, the Hindu Festival of Lights, is observed in the late October or early November to celebrate the triumph of good over evil and to welcome Lakshmi, the goddess of wealth and fortune. It marks the beginning of the financial year for the Hindu business community. The 25th of December, the commemoration day of the birth of "Jesus Christ" is a public bank and mercantile holiday. And at midnight on 24th of December in Cathedrals, Churches and little Chapels all over the island, Christians attend “Mid night Mass” (the Holy Eucharist) to celebrate it in union. Adam’s Peak also known as Samanalakanda (butterfly mountain), and Sivanolipatha Mala is a 2,243 meters (7,359 ft) tall conical mountain located in central Sri Lanka. The annual Sri Pada (Adam’s Peak) Pilgrimage Season begins in December with the full moon day and devotees make the ascent to the mountain’s summit up until the advent of the southwest monsoon in April/May. The peak is crowned by the impression of a 1.8m footprint, "Sri Pada" which is venerated by pilgrims of all religions. Buddhists pay homage to it as that of Lord Buddha, made during his third visit to the island; Hindus believe it was made by the Creative Dance of Siva; while Muslims and Christians believe it to be that of Adam, with Roman Catholics sometimes attributing it to St. Thomas. Pilgrims try to reach the peak before the breaking of Dawn to witness a breathtaking sun rise on a good clear day and a simply beautiful view. There are many ways by which one can carve one’s way through the Adam’s Peak, but the most commonly used one is the route through Hatton Town and the Ratnapura District.